I first got to know Impact NW in 1987 as a care coordinator at a homeless shelter located in SE Portland. Almost daily communication with Impact NW was necessary to provide case management for homeless families. The shelter was born from simple and direct inquiry and discussion between individuals from the church and Impact NW. I loved this work, and my respect and bond with Impact NW was shaped over the 15 year lifespan of the shelter. 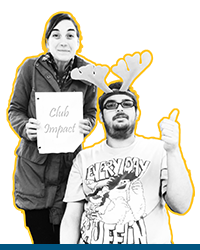 Club Impact Members include young adults with disabilities and their friends, families, and caretakers. My relationship with Impact NW continued in several other areas over time, but the effort I want to tell you about began in 2009. 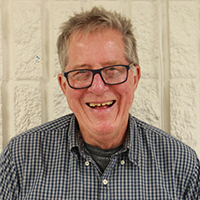 As a recently retired Special Education teacher working with 18- to 21-year-old students, I was keenly aware that students leaving the program where I taught needed continued social connections and opportunities. Without hesitation, I contacted Impact NW with my idea to start a social club for adults with disabilities. A year later I started Club Impact with some essential support from Impact NW. Fast forward almost seven years and the club is going strong. The club meets every week with 35 or so participants some volunteers and other care providers as well. There are challenging and precious things that happen at Club Impact every week. The humor is non-stop. The club is exhilarating and exhausting, and I would not trade it for anything. I feel loved and appreciated beyond measure. If you are hungry for meaningful community involvement, I have some suggestions: volunteer. When you discover your passion, let it be your passion. Explore it. Learn about it. Ask yourself what is missing in Portland related to your passion that you know needs to happen? Seek others with like minds. Make it happen.